N'Koudou lets fly with the winner. 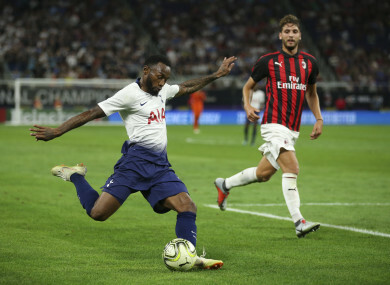 TOTTENHAM ENDED THEIR International Champions Cup tour on a high as Georges-Kevin N’Koudou’s 47th-minute strike gave Spurs a 1-0 win over AC Milan. N’Koudou scored powerfully a minute into the second half to put Premier League side Tottenham in the ascendency after Milan had created the better chances in the opening period on Tuesday. The French winger could have doubled Tottenham’s lead but he was denied by Gianluigi Donnarumma, whilst Patrick Cutrone and Franck Kessie came closest for the Rossoneri – who are reportedly close to signing Juventus pair Gonzalo Higuain and Mattia Caldara – in Minnesota. Tottenham and Milan last met in the Champions League round of 16 in 2010-11, when Spurs advanced 1-0 on aggregate and it was another low scoring night at the U.S. Bank Stadium. Milan, whose last ICC match against Manchester United was decided after a marathon penalty shoot-out, started brightly with Suso causing problems out wide. Spurs also suffered a shoot-out defeat against LaLiga champions Barcelona last week, but a starting line-up still without England stars Harry Kane and Dele Alli posed little threat to Milan’s defence in the first half. The Serie A side pressed as Cutrone’s header from Suso’s cross forced Michel Vorm into a fine save, before the former nodded beyond the post with another effort. Donnarumma and new signing Alen Halilovic were introduced at the break for Milan, but it was Spurs who took the lead when N’Koudou drove towards the Rossoneri goal before rifling brilliantly into the roof of the net. Tottenham, too, made a goalkeeping change at half-time when Paulo Gazzaniga was introduced for Vorm, and the Argentinean was quickly called into action to save from Kessie, before Hakan Calhanoglu’s free-kick drifted just wide. Christian Eriksen and Son Heung-Min were among the names introduced as Spurs aimed to hold onto their lead, but N’Koudou continued to look their biggest threat, as he raced through on goal but was denied by Donnarumma. Milan nearly levelled the scores when Jose Mauri fired wide from the edge of the area in stoppage time, but Spurs held on to win their second ICC match against Serie A opposition, having routed Roma 4-1. Email “Tottenham earn victory over Milan thanks to N'Koudou strike ”. Feedback on “Tottenham earn victory over Milan thanks to N'Koudou strike ”.